Our baby is a little over 4 months old and has come down with a runny nose which is making it hard for him to breath and sleep without being held at an angle. Are there any treatments to relieve this? He doesn’t have a fever so right now we are just trying to keep his head elevated, using a cold air humidifier and waking up every 30-45 minutes with him when he cries from difficulty breathing. Unfortunately, there are no "quick fixes" when it comes to congestion in babies. Most cases of congestion are caused by viral infections and need time to pass. A humidifier and nasal saline are your only tools to help alleviate symptoms. "Cold medications" are not recommended at this age. Since you are already using the humidifier, try nasal saline. Nasal saline drops can be home made or to purchased at most pharmacies. Use 3 or 4 drops, followed by bulb syringe suction. Depress your bulb syringe, cover one side of his nose and apply the suction to the other side. Repeat on the other side. 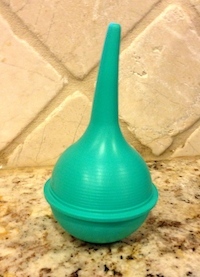 This “snot suction” should help with your son’s congestion symptoms and roughly be equivalent to an adult “blowing their nose”. Unfortunately, bulb suctions does not always alleviate their symptoms and often make little ones cry. When our babies have congestion their noses often become red and irritated from frequent wiping. Try a little lotion on the chapped area. The lotion will help calm the irritation and serve as a barrier for future mucous and wiping. Babies with congestion often wake up in the morning with mucous dried and caked on underneath their noses. When the mucous is dried on, try a bath or shower to remove the hardened mucous. New parents often feel silly for bringing their children for simple “colds”. However, these first few illness are important in learning to gauge your children's health. By taking him to the doctor and learning “it’s a virus” or “it’s an ear infection” new parents learn how their child acts during various illnesses. It is through these experiences that we parents learn how react to future illness.